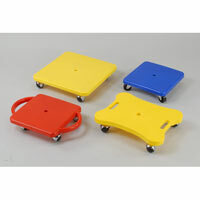 Scooter Board(Scooter series) - Yuan Chi Sports Enterprise Co., Ltd.
Scooter constructed with heavy-duty plastic board attached with non-marring, double ball-bearing swivel casters. With handles to provide safety and balance while sitting on top. Built for indoor or outdoor use, and available in sizes 12" x 12" x 1.5" or 16"x 16" x 1.5" Scooters are available without handles. Size: 12" x 12" x 1.5" or 16"x 16" x 1.5"